The US Federal Reserve’s September 13 Quantitative Easing 3 announcement brings to mind Wayne Gretzky’s famous quote: “A good hockey player plays where the puck is. A great hockey player plays where the puck is going to be.” When applied to what is now officially sanctioned, open-ended, currency expansion, Gretzky’s quote speaks to the future price of gold. Quite simply, it’s going much higher. While the prices of some manufactured goods and labour-based services may not climb as the globe’s largest economies systematically devalue their currencies on a beggar-thy-neighbour basis, gold and other hard assets have no choice but to rise. Jim Rickards documented this well in his best-selling book Currency Wars, and provides an incontrovertible set of facts that run counter to other analysts who have been tricked by currency devaluation’s sleight of hand into believing that no inflation is occurring, or is likely to occur. The Fed’s stated justification for QE3 is that monetary easing will stimulate job growth. If the US was the only country priming the currency pump, this might make sense (see Figure 1). However, Japan, China and the Eurozone are all engaging in monetary easing. 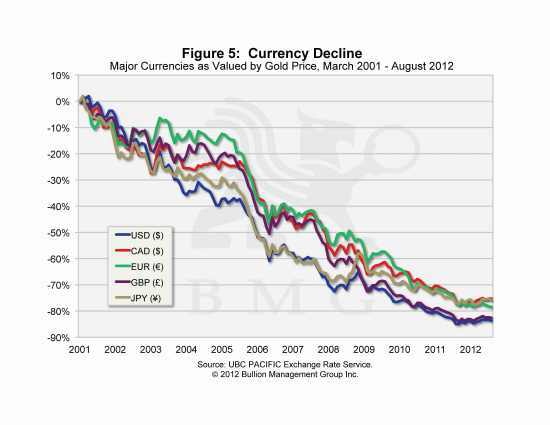 The end result is that central planners are willfully destroying the value of their currencies (see Figure 5). 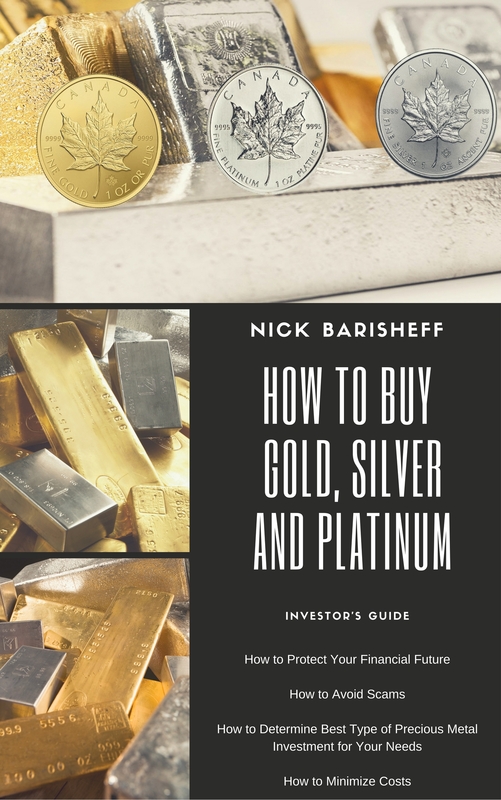 For those invested in traditional stocks, bonds and real estate, this portends massive wealth destruction, and the simple defense is to buy and hold physical bullion. As for QE3’s goal of halting stagnation in the US labour market (a valid reason for concern as we note the lowest labour force participation rate in 30 years), the irony is that today’s inferior employment figures are the direct result of excessive monetary stimulus by the Fed. 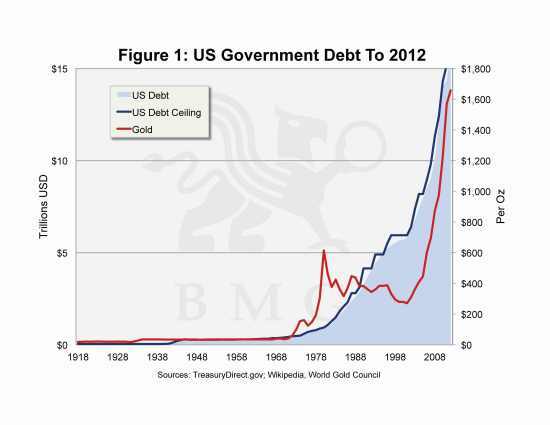 The Fed can pump all the money it wants, but there is a massive debt deleveraging going on, and both US consumers and businesses will continue to save versus spend the easy money being pumped into the system. On the eve of QE3, according to Montreal investment brokerage, Brockhouse Cooper, non-financial US companies held $930 billion in bank accounts, 50% more than before the recession, and the US household savings rate has jumped 4% from the 1.5% low of 2005. Post QE3, gold is telling us something. As noted by Louis Woodhill in Forbes, The Real Dow, which is the Dow Jones Industrial Average divided by the price of gold, actually fell by 0.65% on September 13, the day that QE3 was announced. While the Dow gained 1.6% on that day, gold went up by 2.2%. His calculations show that the Real Dow has declined by 81.0% since August 2000 – the worst economic performance since the Great Depression. Woodhill states that on September 18, 2012, (five days after the announcement of QE3), the Real Dow stood at 7.65, the same level as it was in August 1951. 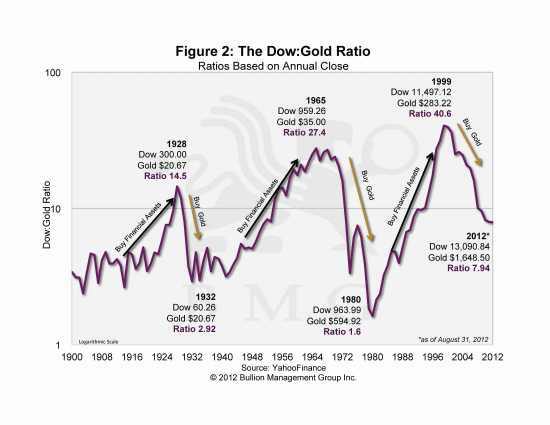 “This means that the disastrous Bush–Obama–Greenspan–Bernanke economic policies have wiped out the real value of 61 years of work, savings, and investing on the part of the American people.” For a historical view of the Dow:Gold ratio, see Figure 2. In addition to QE3, the gold price has several market demand forces propelling it upward. Weary of holding depreciating US dollars and euros, central banks in countries like China and Russia are increasing their reserves of gold and other hard assets, including silver, platinum, farmland and agricultural products, which are untainted by the mirage of financialization. 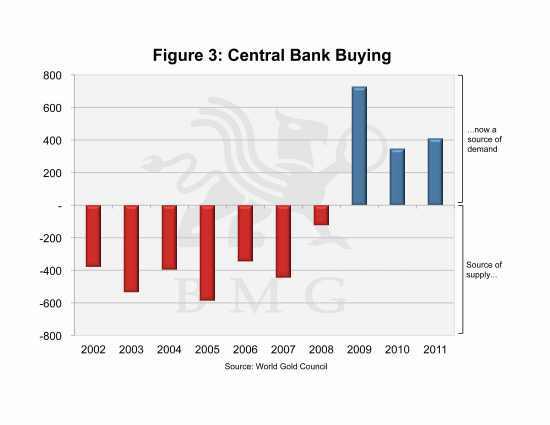 In 2008, the world’s central banks as a whole turned from net sellers to net buyers of gold. In the second quarter of 2012, central banks purchased 157.5 tonnes of gold – a 62.9% increase from the first quarter and a stunning 137.9% increase year-over-year. This was the most gold central banks have purchased in a single quarter since the World Gold Council (WGC) started tracking central bank purchases. Apart from the usual purchases by China and Russia, buyers included South Korea, Turkey, Russia and the Ukraine. Kazakhstan’s central bank has stated that it plans to buy the country’s entire domestic production over the next two to three years in order to reduce its reliance on the US dollar as a reserve asset, confirming that it is targeting an allocation to gold of 15% of its foreign exchange reserves. And China increased its gold bullion by six-fold in the first two quarters of 2012, indicating it too would retain all of the country’s gold production. The significance of this shift becomes clear when you consider that the central banks went from being net sellers of about 500 tonnes to net buyers of 500 tonnes. This 1,000-tonne amount is noteworthy, since annual mine production is only about 2,500 tonnes. The Eurozone crisis provides another fascinating gold driver. Beyond the obvious consumer distrust of fiat currency as witnessed by well-documented bank runs and gold coin purchases in PIIGS countries, the WGC has initiated serious discussions of how gold-backed bonds could reduce sovereign borrowing costs to sustainable levels. The idea is that the Eurozone’s 10,000 tonnes of gold reserves would unlock a cheaper form of financing for Eurozone member states. At national level, those states might reduce the rate at which they issue debt by using a portion of their gold reserves as collateral. Using gold for the purposes of sovereign debt issuance, thus leveraging up the value of a national asset, would allow greater flexibility beyond austerity – a tactic that is rapidly fraying the fabric of Europe’s social trust. While at a nascent stage, these gold-backed Eurozone bond discussions reaffirm gold’s credentials as a unique and highly compelling reserve asset. Another structural financial reform also bodes well for the price of gold. In response to the financial crisis of 2008, new Basel III capital and liquidity standards being implemented by the international Basel Committee for Bank Supervision propose many new capital, leverage and liquidity standards to strengthen the regulation, supervision and risk management of the banking sector. The capital standards and new capital buffers will require banks to hold more capital, and higher quality capital, than under current Basel II rules. On June 18, 2012, the Federal Reserve and FDIC sent a letter to banks that proposes US regulatory capital rules follow the principles outlined in Basel III. The Basel III blockbuster for future gold demand is this: for the first time, gold bullion would have a 100% weighting, and be considered a risk free, Tier 1 asset for commercial banks. Currently, gold has a 50% weighting, and is considered a Tier 3 asset. At the same time, the new Basel III rules propose to increase the amount of capital banks must set aside to maintain capital adequacy – a potential double win for the price of gold. 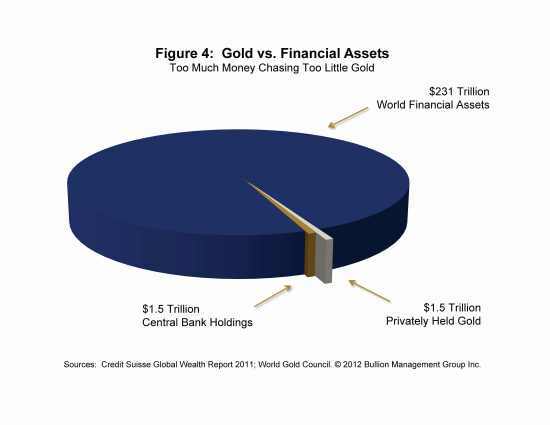 Profoundly, the proposed Basel III rules return gold to its historic role in the global monetary system, a worldwide signal that gold is a wealth-preserving asset and store of value. While these sound money policies are awaiting implementation, the desperation-inspired fiat money policies remain in effect, creating cost-based inflation for the mining industry – another driver for gold price appreciation. There is a direct correlation between inflation and societal unrest as witnessed recently in South Africa, where 75,000 miners went on strike. According to Bloomberg News, production at all of AngloGold Ashanti’s South African mines was halted in September; two Gold Fields mines were suspended earlier because of unauthorized strikes; and workers have been absent from Harmony Gold’s Kusasalethu Mine since at least October 3. At the time of writing, more than 40% of Africa’s gold output is idled while, in order to avoid more wildcat strikes, AngloGold, Gold Fields and Harmony Gold, Africa’s three largest gold producers, offered to raise the wages of the lowest-paid workers by reorganizing job categories. As entire societies in various stages of inflation-induced economic turmoil begin to strike or, in some cases, fight against the daily ravages of currency debasement, mining companies around the world will be forced either to concede to higher wages or close mines – another impetus for across-the-board price increases for precious metals. These macro-economic shifts involving gold have not escaped the profit-seeking eyes of influential billionaire investors or respected market analysts. All-star hedge fund managers, Kyle Bass, Greenlight Capital’s David Einhorn and Third Point LLC’s Daniel Loeb, are all on record as favouring ownership of actual physical gold bullion bars – in allocated storage in a secure vault. Meanwhile, John Paulson told his clients at Paulson & Co. in February that gold is his best long-term bet, serving as protection against currency debasement, rising inflation and a possible breakup of the euro. 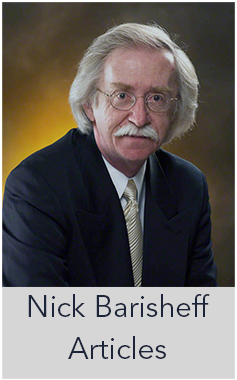 Before I state my own long-term price objective for gold, I want to point out a counter-intuitive trend that speaks to the price of gold, but also to the principles of uncompromised ownership of physical bullion as practiced at my company. As bullion’s popularity rises, there is evidence of more schemes, frauds and leveraged investment products designed to part investors from what could be their real money. At the core of all of those schemes, often buried in the fine print, is a shaky or non-existent bullion ownership structure. Fifty thousand Polish citizens recently learned this the hard way after a fund called Amber Gold collapsed, owing them 80 million zloty (20 million euros). It is doubtful that any of the 50,000 people took the trouble to read and understand the documentation of Amber Gold – a fatal blow to their wealth preservation. To return to the central issue of QE3, history will show it to be the last stand of financialization. As with any addiction, monetary easing will work for its users until it doesn’t, and when it stops working, there will be a catastrophic system failure. The important thing for investors to note is that every fiat currency regime in history, with no exceptions, has led to hyperinflation followed by a complete currency collapse. This time is not different. 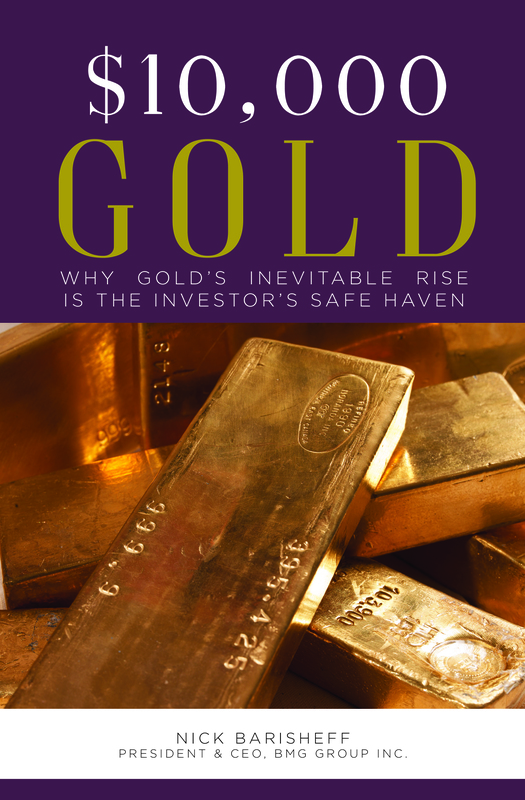 I believe that a reasonable five-year price objective for physical gold is US $10,000 an ounce, and I’d urge people seeking a deeper understanding of where gold is going to be to pre-order my book, $10,000 Gold: Why Gold’s Inevitable Rise Is the Investor’s Safe Haven, available from Amazon.com or your favourite bookseller.